This hypothetical game is set in the Trans Mississippi in October 1862, and follows the further adventures of Sterling 'Pap' Price, erstwhile populist Missouri politician, who featured in an excellent series of scenario games run for us by Stefan, earlier this year. In the spring of 1862, Generals Van Dorn and Price led the Confederate troops in Arkansas to the east of the Mississippi, as reinforcements, after the Confederate retreat from Shiloh. 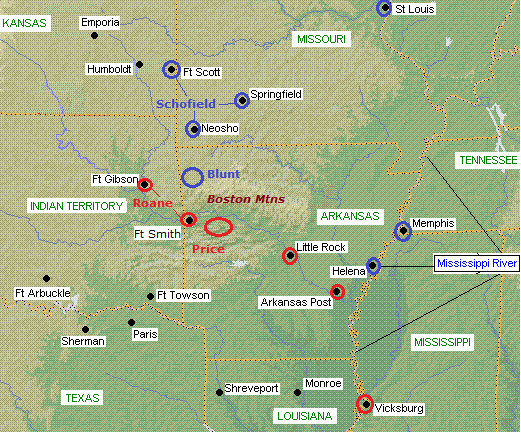 Left for the defence of Arkansas were only a few militia, together with a mixed force of Confederate Indian and Texas cavalry under General Roane, based at Fort Gibson and Fort Smith. Union forces under the ardent Kansas abolitionist, General Blunt, have been successful in minor engagements against these troops during the summer. In recent weeks Blunt's division has occupied a rich agricultural region in NW Arkansas, with his base on the commanding Kennard Plateau. His troops have assisted in bringing in the harvest, taking care to requisition a good portion of it. Additional Union troops have been collecting in Missouri under Blunt's superior, General Schofield. In the meantime, the Confederates have been raising a new army in Arkansas by enforcing their conscription laws. After his great victory at Corinth, General Price has moved back west of the Mississippi to take command of this force, turf the Union out of Arkansas, and recover his beloved Missouri. Several thousand Missouri volunteers are believed to have made their way south into Arkansas to join him. The game will feature an unusual situation, and very different armies, from those found in Tennesse and Virginia. This scenario needs 9 players, although more could certainly be accommodated if there is sufficient demand. One thing I should say right up front is that each of these main commands is larger than a single brigade. I am aware that several of you like to play at brigade-level, but the scenario just won't work on that basis. That said, most of the commands are either small divisions, or say just one brigade and a battery or two. Hopefully this will allow you to humour me and stretch a point. I am encouraged in this hope by yesterday's campaign battle, where most players commanded a division. The game will probably last about 2.5 hours. Happy to answer any questions............short of giving away sensitive information, of course. I'd like to join up. This sounds like a cool scenario! Father General wrote: I'd like to join up. This sounds like a cool scenario! Excellent news FG. Your very presence will add class to an otherwise tawdry brawl. But you do need to doodle, Your Eminence. I am not aware of any doctrinal reason why you should not. I appreciate it's short notice for the coming weekend dates folks, but we may yet do it. Including Neal, we're 2/3rds of the way there already. I will need to send out maps, OOBs and other briefing material to you all before the game. Can I ask anyone who has not previously done so to send me a personal message with their actual name and email address please? I think kg little mac is the only one so far in that category. I would like to play and will be able to play most days at 20:30 gmt. kg_sspoom wrote: I would like to play and will be able to play most days at 20:30 gmt. That's great Steve. Maybe we'll make you a reb this time? With you that makes 9, although ideally I would like 9 plus me, rather than 9 including me, as I think it best if I take an observer role. At the moment Saturday the 15th November is looking to be the favourite date, but if you and (ahem) the FG would kindly doodle your availability, that might change. Btw this being the Trans-Mississippi, there are a number of cavalry commands in this scenario. Or perhaps I should say mounted infantry. If anyone especially fancies playing one of these, please let me know. I will doodle my availability when I get home as my phone doesn't like doodle. I'm fine with either side. I will happily take a cavalry command, sir! FlashmanKBE wrote: I will happily take a cavalry command, sir! Well volunteered Ollie, although I see you cannot make Saturday 15th which looks the most likely date at the moment, by some margin. Is that a definite no for you? If there is sufficient demand, I can always run it again later, probably with some tweaks. I see we've had some more recruits so we're now up to 12, including FG & Steve. We can certainly still fit a few more in, as folks can always command brigades in the larger divisions. It's actually my Birthday, and I suspect that there may be many reasons I can't turn up. If I possibly can, I will be there! FlashmanKBE wrote: It's actually my Birthday, and I suspect that there may be many reasons I can't turn up. If I possibly can, I will be there! No such extenuating circumstances for the Father General, who has still yet to doodle! I fear it's an episcopal court for him! If we do go for the 15th, that should give plenty of time for team discussion, after I send out maps & briefings. I would aim to do that before this weekend. Just signed up -- looks like fun. I'm happy playing either side, and would prefer direct control of a single brigade within a division, or a brigade & guns. WJPalmer wrote: Just signed up -- looks like fun. I'm happy playing either side, and would prefer direct control of a single brigade within a division, or a brigade & guns. Splendid. It should be possible to accomodate you. Including the FG (but excluding Ollie) that makes 12 of us I think for Saturday 15th. At the moment that appears to be the only doable date, so I'm going to firm-up on it here & now. We'll aim to start at 19.00 (7 pm) UK time, which everyone appears able to make. What I will do now is work out the teams, taking account of any preferences expressed. I will then email each team it's briefing material. It looks as if we have enough players so that some can act as reserves, in case of late drop-outs. If everyone shows up, then the reserves can play as brigade commanders, which some will no doubt prefer. I will appoint the CinCs, but leave them to decide who takes which command under them. I will leave the doodle open, both for the Saturday 15th December and the January dates. We can always fit more players in. I didn't realize it was U.K. time so I probably won't be able to play. I re-doodled the time I can probably make it. Let me know what date I will probably need to get off early. J.B. Hood wrote: I re-doodled the time I can probably make it. Let me know what date I will probably need to get off early. Well done. Saturday 15th December. FOR THE RECORD - Father General will NOT be appearing at this battle. There appears to be a slight preserence for starting at 19.00, but poor old J B Hood cannot play before 21.00. But if we start then, it appears that Baldwin cannot make it. J B Hood & Baldwin, if we split the difference and start at 20.00, could you both tweak your schedules and play? No sorry. It's already going to be tricky to get off that early. I work in retail you see. Might be better to go with Baldwin. I will try but no promises. Neal will obviously be the Union CinC. My boss just confirmed that I can get off Saturday the 15th in time. Then again I'm new so you might want to go with Baldwin because of experience. Uncle Billy wrote: Neal will obviously be the Union CinC. I'd LOVE to Kevin! Ah, but for some unknown reason, every time I play Union, my computer crashes. Must be some bug in my copy of the game. It's probably best for me to stick to the side that doesn't crash my computer...a new meaning to the phrase, " Blue Screen of Death." J.B. Hood wrote: My boss just confirmed that I can get off Saturday the 15th in time. Then again I'm new so you might want to go with Baldwin because of experience. Excellent. So you can start at 19.00? Sorry, negative. I can start at 2100. Thats what he approved. We are not allowed to take vacation during this time as well. In the name of Christmas spirit and helping my ole friend Hood I believe I can re arrange my schedule for 21:00. You please me dear Sir Baldwin. Merry Christmas to you and all.